The Malta U-16's girls squad are in the final stages of their preparations for next week’s UEFA Youth Development Tournament at the Centenary Stadium. Coach Dorianne Theuma has selected a squad of 20 players for the tournament which will see the Maltese girls face Albania, Andorra and Gibraltar. Gibraltar are Malta’s first opponents on matchday one of the tournament on Tuesday, March 5. 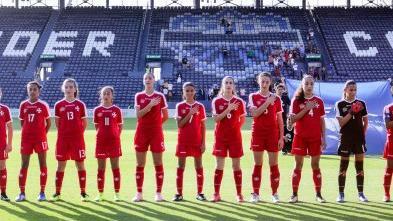 Two days later, the Maltese girls take on Andorra before concluding their commitments on Saturday (March 9) against Albania. The majority of the players in Theuma’s squad represented Malta in a similar development tournament for U-15's teams, held in Thailand last December. “This tournament is another great opportunity for our young players to improve and gain more experience at international level,” Theuma told www.mfa.com.mt. “These three matches will also enable us to further assess our players following our trip to Thailand in December. The Malta U-17's women’s team have been drawn against France, Iceland and Belarus in the qualifying round of the 2019/20 UEFA European Women’s U-17's Championship. Belarus will host the Group 3 tournament in September 2019. The Malta FA is hosting this UEFA Youth Girls Development Tournament for the third time while the U-16's girls team are taking part in this event for the fourth time. In previous tournaments, Malta collected six wins from nine games, including three home victories over Andorra, Gibraltar and Liechtenstein in last year’s edition, also staged at the Centenary Stadium. Giulia D’Antuono (Mosta); Justyne Caruana (Luxol Raiders). Alexandra Gatt (Mġarr United); Laura Chetcuti Dimech (Luxol Raiders); Martina Fenech (Mosta); Izabella Camilleri (Gozo); Nell Zarb Cousin (Hibernians); Rhea Borg (Mosta); Georgiana Mifsud (Gozo). Mariah Cardona (Birkirkara); Hannah Khatib (Hibernians); Martina Cortis (Mosta); Maya Lucia (Luxol Raiders); Haley Bugeja (Mġarr United); Elena Sissons (Hibernians); Emma Philippa Ciantar (Luxol Raiders); Gaia Antonelli (Luxol Raiders). Laura Hannah Muscat (Luxol Raiders); Kailey Willis (Birkirkara); Veronique Mifsud (Birkirkara).